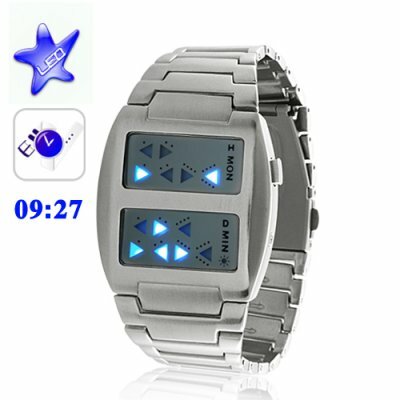 Successfully Added Templar - Japanese Style Inspired Blue LED Watch to your Shopping Cart. You mean this watch really tells the time? Yes. Even though The Templar embodies Crusade-like Spartan style and Monotheistic less is more design with its cold blue three sided isocelestic polygons in all directions encased in true Templar tripled tempered titanium like the furious button mashing you are called upon to do while playing the 32nd and final mission of Devil May Cry 3: Dante's Awakening at the highest difficulty, this Japanese LED watch does in fact tell the time and does so really efficiently too! Tap the top button on the right side of the timepiece and watch the screen light up like metallic blue destiny spears penetrating The Darkness. Pierce the bottom button to make the numbers blink and hence adjust them. In Time mode, each of the four rows represents a single digit of time. So that 11:11 am would be represented by all of the four blue triangles with a single dot along its hypotenuse. Same goes for date mode. In fact, when you start wearing The Templar you may find yourself spending yourself speaking in Aramaic (assuming you didn't know how to do that before), raising the dead (yes like in Zombies!) and possibly launching Denial of Service attacks against Unbelievers! You'll start walking the razor's edge (Occam's of course) and know deep secrets like if you were to take all the consecutive "leet"-able numbers in Pi and string them together you would get the complete text of the Necronomicon. The Big Show and Andre The Giant are said to be Templar owners, as is Ricky The Steamboat Dragon and Leonard Nimoy. In reality, this watch is perfect for Massive Attack fans, The Order of the Jedi Knights, The Order of the Boogie Nights, people who follow the 10 Crack Commandments, or anybody who is a somebody. Some may argue that the 32nd mission for Devil May Cry 3 is not the hardest button mashing battle known to man. Some claim it is the final battle in Diablo 2 without cheats or hacks. Others claim it is final battle of Quake, Wolfenstein, or Duke Nukem. And yet still others claim it is the final battle in Japanese SHMUP classic Mushihimesama Futari (http://www.youtube.com/watch?v=nscP9QpXoFM). The Templar watch wants it to be known that it respects all game religions and final god bosses! Why is this watch called The Templar? Because it can only be wielded by those with Magick ability. Let me put it to you this way. If the real life you is equivalent to a Dungeons and Dragons Magic User level 10 or less character I would not recommend wearing this watch! You mentioned that this watch is perfect for Massive Attack fans, The Order of the Jedi Knights, The Order of the Boogie Nights, people who follow the 10 Crack Commandments, or anybody who is a somebody. What if I don't belong to one of these groups? This watch is also perfect for Code Geass fan-subbers, Party Ben remixing House of Pain vs Queen vs AC/DC fans, Tommy Bottoms fans, anyone whose read Vilette by Charlotte Bronte, anyone who can sing the entire That's Why You Go Away by Michael Learns To Rock at karaoke, as well as direct descendants of real Templars.